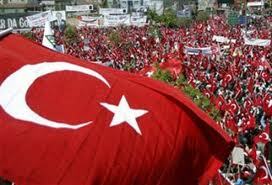 ANKARA – Turkey’s once powerful General Staff is reportedly struggling amid the resignation of senior military officers. Military sources said senior officers were increasingly choosing early retirement rather than confront the intervention of Prime Minister Recep Erdogan. They said many of the officers were dismayed by the return of personnel linked to Islamist groups as well as the arrest of 400 officers accused of supporting a coup against the ruling Justice and Development Party. “The conclusion of many of mid- and senior-level officer is that the military is turning from secular to Islamist,” a source said. The General Staff has acknowledged the resignation of an unspecified number of officers. But the command, which oversees the second largest military in NATO, said the retiring officers could be replaced. In 2011, Erdogan oversaw the resignation of the chiefs of the three military services in protest of his intervention. The prime minister then selected his own candidate for chief of staff, and since then the military stopped expelling officers accused of Islamist leanings. For his part, Erdogan said the reports of mass resignations of officers did not reflect any weakness in the military. He said the reports marked an effort to destabilize Turkey’s armed forces.